There is a lymph node present under the arms which becomes swollen or enlarged that is the condition which is called armpit lump. This appears due to some infection on this area. This swelling in its initial stage is small as the size of a pea but by the time it becomes enlarged. 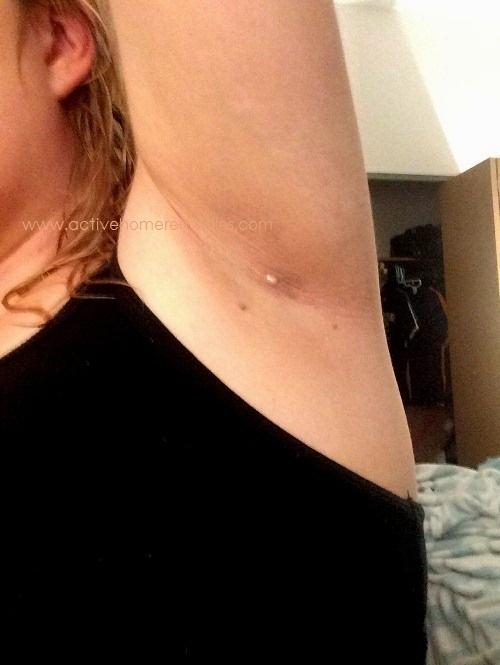 There are so many causes of armpit lump that include viral or bacterial infections, shaving or use of antiperspirants, allergic reactions or fat tissue growths and therefore the symptoms depend upon the causes. The common symptoms would be pain in the armpit, swollen armpit and the lymph nodes, loss of appetite, rashes, and flu-like symptoms. Armpit lump occurs in men and women of all ages. In most of the cases, it does not need any treatment and start to disappear as your body is able to fight against the cause. Mostly the women are victim of this problem and they should consult the doctor immediately as it indicates the breast cancer. If you notice that underarm lump is found within the armpit more than two weeks, you should take an immediate action towards it. At the same time, you should try some natural ingredients to treat the armpit lump. The remedies are pure and natural which do not have any kind of side effect and helpful for those who are suffering this problem. It is an age-old remedy to deal with armpit lump. Hot temperature would be helpful in increasing the blood circulation and gradually it reduces the size of the armpit lump and eases the pain. Soak a thin towel in hot water. Place this towel under your armpit for about 10 minutes. Repeat 4 times daily in a week. Vitamin E contains powerful antioxidant that is helpful in healing the armpit lump within few days. Vitamin E oil prevents the swelling and helps in retaining the moisture and repairs the skin. Massage the armpit area with vitamin E oil for few minutes 3 times daily for a week. Vitamin E supplements are also good to take after consulting the doctor and you should try to take vitamin E rich foods like almonds, sunflower seeds, spinach, extra-virgin olive oil, asparagus, beet greens and others. Apple cider vinegar is an effective remedy for armpit lumps as it helps in drying out the lump and eases the pain. It contains antibiotic and antiseptic properties which fight against the infection and healing. Mix equal amounts of raw, unfiltered apple cider vinegar and water. Now take a cotton cloth and soak it in this solution then apply on the armpit lump. Leave it for about 5 minutes then rinse it off with warm water and pat dry. Repeat the process few times daily until you notice the lump disappears. You can also add 1 tsp of each raw honey, unfiltered apple cider vinegar and honey together in a glass of water. Drink it once or twice a day for few weeks. Echinacea is another effective remedy for reducing the armpit lump. This herb is helpful in healing the lymph systems which in turn reduce the lump disappear. Echinacea has antibiotic effect which helps in eliminating the infection by purifying the blood. Buy Echinacea cream or ointment and apply directly to the lump 3 times a day. Continue until you get rid of the lump. You should drink 2 cups of Echinacea tea daily to fight against the armpit lumps. Do this remedy for a week. Note: people who are suffering from autoimmune disorders must not use this herb. Honey is another remedy to treat against the armpit lump. It helps ease the pain and reduces the swelling and irritation. Honey is one of the best natural antibiotics and helps in fighting against the infection. Apply some raw honey directly on the affected area then wait for 10 minutes. Rinse it off with warm water. Do this remedy for 3 times a day. You can also mix 1 tsp of honey in a cup of warm water or green tea then drink this a couple of times daily for few weeks. Lemon juice contains vitamin C and various anti-inflammatory substances that help in reducing the swelling and pain of an armpit lump. It is a natural astringent. Dip a cotton ball in a fresh lemon juice and apply it on the lump. Leave it on for about 20 minutes then wash it off with lukewarm water. Repeat the process 3 times daily for a week. You can also add the lemon juice and some honey to a glass of water and drink it twice daily for few weeks. Turmeric is the best ingredient as it contains a healing property and anti-inflammatory property. It reduces swelling, reduce pain and promote healing. Mix 1 tbsp of turmeric powder with enough amount of honey to make a paste. Apply this on the affected area and wait for 10 minutes and rinse it off with warm water. Do this for 3 times daily for a week. Also, drink a glass of warm turmeric milk daily for a couple of weeks. You can use this amazing antibiotic ingredient to treat your armpit lump yourself. It is helpful in cleaning the system, ease the symptoms of armpit lump and accelerate healing. Make a paste of few garlic cloves and apply directly on the affected area. Allow it to sit for 5 minutes then wash it off with warm water. Do this once or twice daily for one week. You can also eat 3 raw garlic cloves on an empty stomach daily. Add garlic in your cooking as well. Aloe vera has moisturizing and anti-inflammatory properties and it can stimulate healing of lump that is the cause of pain. It also reduces pain and swelling. Extract the fresh gel from an aloe vera leaf. Apply it directly on the affected area, rub gently in a circular motion. Leave it for 30 minutes then wash it off with cold water. Use this remedy 3 times daily for about a week. Coconut oil is another good remedy for armpit lumps as it contains anti-inflammatory, antibacterial and antiviral properties. It is a good moisturizer which promotes healing. Warm up some quantity of coconut oil and apply directly on your armpit. Use gentle strokes; massage the affected area for just 5 minutes. Massage helps in increasing blood circulation. Repeat the remedy few times daily for a week. You can also eat 1 tsp of extra-virgin coconut oil regularly. Avoid caffeine as it can delay the healing process. Avoid spicy foods as it can secret the more sweat which results in more bacterial development. Do not share your towels with others. Avoid scratching the lump which cause the infection to spread. Avoid using any talcum powder or perfume with high fragrance until the lump is disappeared.